THE LAB determined that an EASYHEAT™ 1.2 kW, 150-400 kHz induction heating system with a custom-designed single position multiple-turn helical coil would be the right solution for their application. 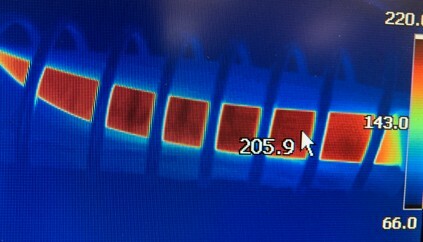 An infrared camera was used to measure the temperature of the knife blade during the testing process. With the EASYHEAT 1.2 kW power supply, it was observed that it took just over 20-25 seconds to heat the blade to 200 °F (93 °C), meeting the client’s objective. The speed of heating, induction's repeatability (same heating time and result every time), and the prospect of a safer work environment were the key benefits to the client. To read other heating application notes from THE LAB at Ambrell, visit our heating applications page.